The da Vinci System is one of the most popular surgical robots around, which allows surgeons to perform operations through only a few small incisions. The device works by translating a doctor’s hand movements into smaller, precise movements of tiny instruments inside the patient’s body. As ubiquitous as they may be in hospitals, chances are it’s never been operated quite like this before. 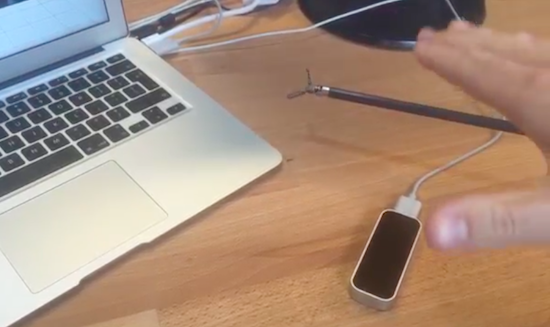 That’s because Julien Schuermans has managed to connect the robotic surgical tool’s hardware up to a LeapMotion controller, making its small forceps gesture-controlled. You can see how it all works in the video below. As The Verge explains, four Arduino Uno-controlled servos are fitted to the pulleys and cables that handle the rotation, angle and gripping mechanism. Gesture input is captured by the Leap Motion’s infrared cameras, which is then converted into instructions for these servos, enabling the user to command the endoscopic device with just a wave of the hand.